Children grow up too fast these days. Soon, the days when they no longer believe in Santa, the tooth fairy, and the Easter bunny will be here. As a parent, there are some measures you can take to make this period last a little longer. Giving these imaginary creatures some authenticity never hurt, at the very least, it will give them pause when the kids in school tell them there is no Santa. Children want to believe in these things; it is part of what makes being a child exciting. Take it from me, a person who believed in Santa until she was 17. My parents had the Santa thing down to a science: there were no elves, Santa had a factory in Alaska, he had millions of helpers that delivered his presents, my parents had to pay them, they came through the front door, etc. They basically made it sound like Santa was a just the middleman between Mattel and UPS. While this may have not been in the spirit of Christmas, this back story rang of authenticity and had me believing until the devastating day when my dad took me to Ross and told me to pick out what I wanted in my stocking on Christmas morning. It’s not that I didn’t have my doubts about Santa before I was 17 but Christmas has never been quite as fun since. I plan on lying to my daughter until she leaves for college because I want her childhood to be magical as my own. Anyways, since we’re a dental office, let’s explore how to give your child an exciting tooth fairy experience. 1. The Fairy Dusted Dollar: Glitter, Hairspray, Done. 2. Gold Coins & Glitter: Trading dollar bills for pretty gold dollar coins makes the money more special. They can also play pirates with it later. 3. 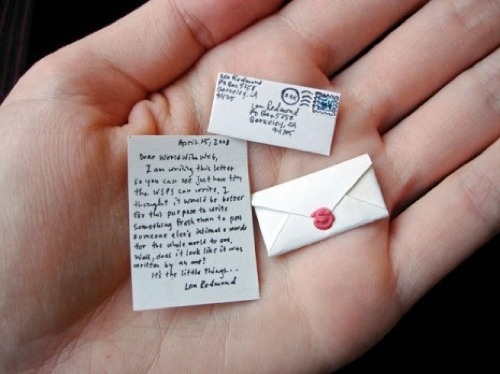 The Microscopic Letter: Put on your reading glasses and write your child a letter from the tooth fairy’s own “hand” thanking them for their tooth and reminding them to brush their teeth. Don’t forget the little envelope! You might want to have a magnifying glass nearby for when your child wakes up. 4. The Tooth Receipt & Pouch: This can be a more involved process if you decide to sew the pouch yourself but it is worth the effort to have a customized one with your child’s name or favorite design. Just attach it to his or her bedpost with the money and receipt and you don’t even have to mess around with their pillow. 5. Fairy Footprints: These two are variations on the same idea which suggest that either the tooth fairy leaves fairy dust trails or has very dirty (red?) feet. The footprints in the glitter is a prettier but entails a more involved clean up. 6. The Built-in Fairy Door: This is by far the most involved project and may require you to know your way with a carving knife. Installing a life-like fairy door next to your child’s bed may seem extravagant, but it is little details like this that infiltrate and inspire your child’s dreams. Your child will always wonder what’s behind that door, even beyond their tooth fairy believing years. Thank you for the comment! Glad you enjoyed our article. Keep coming back for more!